I've been using Mozy for several months now, to store copies of important personal files. The scheduled backups have happened without a hitch, the interface is easy to use, and in general the service has worked for me as advertised. The MozyHome Free plan offers 2 GB of space free, with unlimited storage space for $4.95 per month. Supported platforms include Windows Vista, XP, and 2000; MozyHome for Mac is available in beta. MozyHome is for personal and non-commercial use only, however. Business users (and those who need HTTPS proxy support) will have to move up to the MozyPro version, with a desktop license priced at $3.95 + $0.50/GB per month. Over the weekend, I've been testing SugarSync as an affordable online backup service for business use. And it's looking very good indeed. This is not just a dumping place for data, but a new way to organize and work with your files on-the-go. The online backup files are automatically synchronized with those on your computer, so any changes you make to your folders or files on your hard drive are automatically reflected in the online copy. And if you're working offline on a file, that's okay: those changes will be backed up automatically the next time you're online. 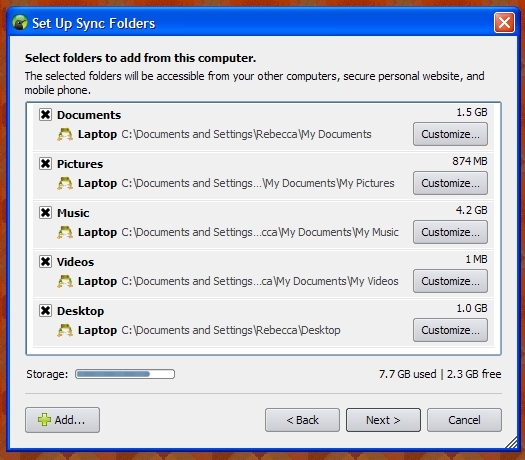 Not only that, multiple computers can be set up for synchronization in real time, with a "Magic Briefcase" that works very much like the Briefcase in Windows: Edit a Magic Briefcase file on one computer, and every computer on your SugarSync list will be sync'd automatically to have the same up-to-date version of the document. The advantages for collaborating with a trusted partner or project team are clear, and as for privacy -- you get to choose which files you want to have replicated and accessible to the other SugarSync'd computers or mobile phones. After the initial full-scale backup, of course, only the changes you make will have to be recorded: those updates take place almost instantaneously. SugarSync's not free, but it's very affordable: Five different plans are available to fit different storage needs, starting at $2.45 per month (or $24.99/year) for 10 GB of space. A 45-day free trial gives you 10GB of storage space and access to all features, and you won't need to give any credit card information to try it out. See the SugarSync FAQ for more information. Thanks, Jenny - your website looks to be very helpful indeed. It would be interesting to read more about the criteria used for your "top 25" lists of backup services. If anyone is looking to sign up with Mozy there is a 25% discount this week in response to problems with HP's Upline service. So now is a good time to sign up! There is normally a discount of 10% available on new Mozy accounts.